A new, more luxurious camping alternative will give campers stunning views of Mt Washington, NH, and the Presidential Mountain Range. Shawnee Peak will provide everything to make your stay comfortable. Campers will bring their own food and sleeping bags. Shawnee Peak Ski Area in Bridgton, Maine, will offer year-round accommodations in Pleasant Mountain Yurts - a new mountaintop lodging option. A more luxurious alternative to traditional tent camping, Yurts give campers a sturdier, warmer, dryer experience, while allowing campers to experience the great outdoors and stunning views of Mt Washington! Ultimately, there are plans for three individual yurts, which will be placed along the Sunset Blvd Ski Trail. Two of the yurts will sleep 6 people, 1 yurt will sleep 2. Planned pricing will be $125/night plus tax for double occupancy plus $10/night/person extra. "This is a wonderful lodging option for folks who love the camping experience, but don't want to set up an entire camping site," said Ed Rock, General Manager and VP of Shawnee Peak. "Because all the yurts will face west, the views of Mt Washington and the Presidential Range will be stunning. Imagine enjoying your evening meal with the sun setting over Mt Washington. It will be incredible!" 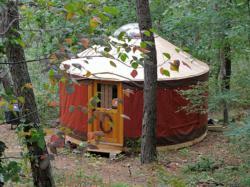 Hikers will love staying in yurts! Summer yurt stays will include swimming and canoeing in Moose Pond from Shawnee Peak's private dock and float. In winter, skiers and riders can stay in a yurt and have early-morning access to the slopes! All stays will feature incredible panoramic views of the Presidential Mountain Range (including Mt Washington! ), basic furnishings (dining and bed futons w/cushions), cookware, plates, utensils, firepits and bottled water for cooking and cleaning. Summer guests should be prepared to hike to the yurt site (approx 1 hour hike uphill) and back down to the Main Parking area at the bottom of the Mountain. Winter guests will take the lift and ski down. All guests will provide their own food and sleeping bags (futon sleep cushions are in the yurt). All of the wood components used to build Pleasant Mountain Yurts are CSF (Certified Sustainable Forestry), hand-selected, finely sanded, and finished with an oil preservative to ensure lasting durability.